School hasn’t started for my two oldest grandsons yet, but I wanted to continue their learning as the summer was ending for them. I decided to use one of the subjects that all my grandsons find interesting as a theme for some lessons. Now, my grandsons had always been enthused by anything on wheels, and lately I’d seen them play a lot with their construction vehicles: dump trucks, bulldozers, etc. So I ordered several books from the local library and created some lesson plans that I will share with you in this post. 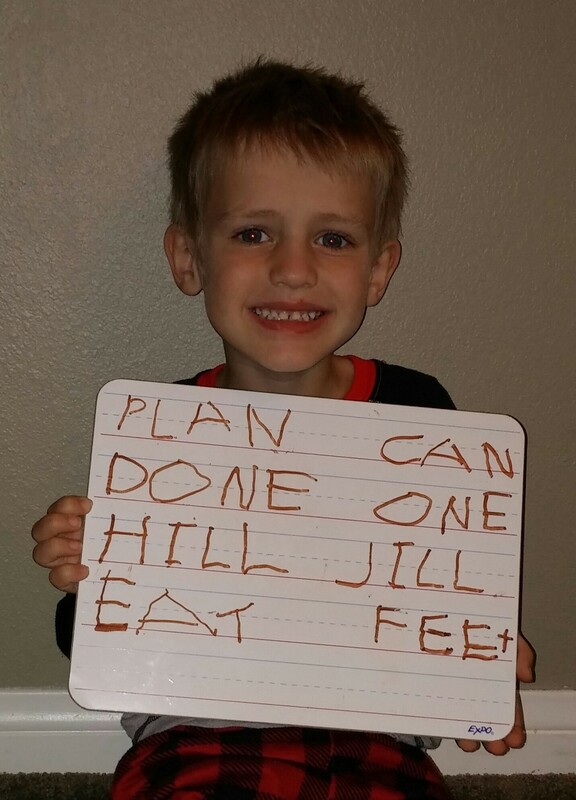 As always, I planned a variety of lessons in each intelligence to have differentiated activities for each grandson: Tigger (7), Kona (5), and Tahoe (3). We spent two weeks on this study unit, and completed at least one activity for each intelligence during that time. Read books-These are the books I borrowed from the library and used to create the lesson plans. I read at least one of these books to the grands each day during the two week period. One Big Building by Michael Dahl is a counting book showing construction workers busy working on a twelve story building. All the grands enjoyed this book whether they were counting or measuring the items in the illustrations. The books Construction and Demolition by Sally Sutton also have wonderful illustrations. Besides describing the different jobs, machines, and tools needed in the construction and demolition processes, there are rhyming words and samples of “sound words” (onamonapeia) to discuss with the grands in these books. Discussions-Whenever I read to the grands we are always making predictions on the topic of each page by looking at the illustrations, and having discussions on the vocabulary. Making Lists and Writing Simple Paragraphs- After reading the book, One Big Building, Tigger (7) and I discussed the topic “vehicles” and he made a list of vehicles from the story. Then I modeled orally how to use this list to plan a paragraph which included a topic sentence. I will continue doing this with Tigger over several days until he understands how to use the list to create an oral paragraph. Then I will actually have him write the paragraph about vehicles. Rhyming words-The book Builder Goose contains familiar nursery rhymes and songs rewritten with a “construction” theme. After reading the entire book to the grands, we discussed rhyming words and the grands wrote some of rhyming words on a dry erase board. Figurative Language-Onamonopeia-The books Construction and Demolition have lots of examples of Onamonopeia (sound words) in it, such as Clang, Swoosh, and Thonk. I thought this concept would be easier to explain, but the grands didn’t quite get it. They think most words make sounds. (“But, Mimi, chair must be a “sound” word because it makes a sound when it is pushed around on the floor.”) Well, at least they have been exposed to this concept. Mastery will come after a lot more examples I’m sure. Videos-I played several videos I found online that showed construction vehicles in action. Freestyle Crafts-We did several kinds of crafts in this themed unit. Some days I had the older grands cut out rectangles and squares from construction paper (I modeled how to make rectangles and squares with a ruler first.) Then the grands could create their own buildings by gluing the shapes on a larger piece of construction paper. Tahoe (3) doesn’t cut on lines yet, but he was happy practicing his cutting skills on scrap paper and using the pieces he cut for his projects. Kona cuts out long rectangles from brown construction paper for the other brothers to use. I love to see how each grandson uses their own creativity in “constructing” a building out of construction paper. Tigger is very proud of his project. After gluing together his “building,” Tahoe decided his project needed more colors. Directed Projects-Other art activities were more directed. I made a sample of a concrete mixer using ovals, circles, half circles, squares, and rectangles made from construction paper. I also wanted the grands to get drawing practice, so I found some online videos that showed step by step directions to draw some construction vehicles. We tried one of them that basically used rectangles, squares, and circles, and was easy enough for Tigger and Kona to follow. Kona created this art project using squares and rectangles he had cut out. I have circle punches that the grands love to use to cut out circles for their art projects. This is Kona’s drawing of a dump truck which he drew as we watched a step by step video online. Dramatic play-I love using dramatic play as a way to help the grands understand the stories I read to them. A fun activity was to have the grands pretend they were the characters in the book and act out the book with their siblings and/or adult. Building Together-The grands love to help my hubby, Grandpa Jim, with handyman projects around the house. The boys learn how to use tools, and Grandpa Jim gets some assistance, so it is a win-win situation. Grandpa Jim and Tigger work together to put together a seesaw for our backyard. Both Tahoe and his older brother lent Grandpa Jim a helping hand to put together their new seesaw. Pantomimes- The grands and I discussed some of the construction jobs from the books and together we practiced pantomimes for each of them. Then we played a game where the grandsons pantomimed one of the jobs and the rest of us had to guess which job he was performing. 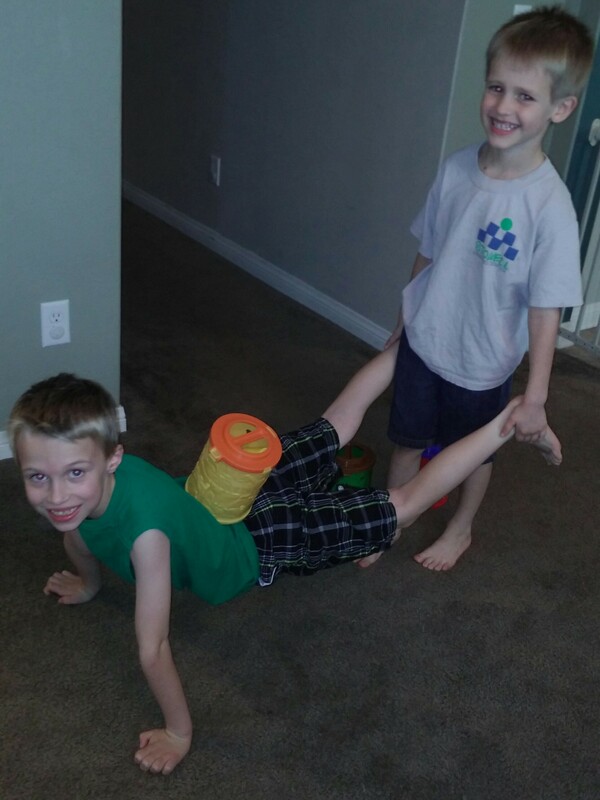 Human wheelbarrows-Making human wheelbarrows is a good way to help develop their upper arm strength and coordination. Counting and measuring activities: There are always lots of counting opportunities for Tahoe in most of the books we read, but I added measurement for Kona and Tigger. Then I had the oldest grands practice drawing various lengths with a ruler on a dry erase board. Kona used one of the drawings in One Big Building to practice his measuring to the nearest inch. Kona practiced drawing lines to the nearest inch using a wooden ruler. Creating Addition Problems-I used one of their toy trucks and some building blocks to “construct” word problems for Tigger and Kona. Here is a “construction” math problem: Tigger’s truck has eight blocks on it. He wants to add six blocks to the truck. How many blocks will then be on the truck? After adding the six blocks to his toy truck, Tigger finished the equation. First Kona used two toilet paper rolls to see how many large books they would hold. With three toilet paper rolls, he discovered he could place more books on the structure. Next Kona added books to four toilet paper rolls. He placed them straight in a row. Next time we do this I’ll experiment with the placement of the cyclinders. 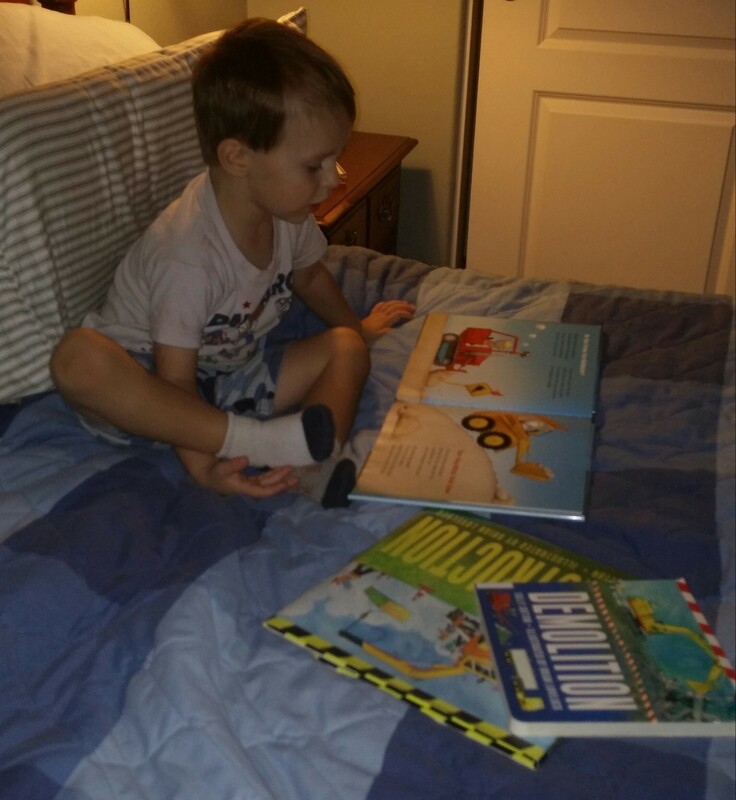 Personal reading – Giving the grands personal time to look over the books I have read to them gives them a chance to explore at their own pace. Tahoe enjoys looking over the books I have read to them and retelling the stories to himself. Building Towers-The grands also enjoyed being able to play with the building blocks all by themselves. It is interesting to see the different types of structures they create when allowed to work on their own projects. Tahoe decided to construct a tower with the blocks. Field trips-There are many opportunities to see construction in our area, so we stopped at a site (at a safe distance) and discussed the tools, machines, and vehicles that were being used. Also we discussed how nature had been changed by the new construction. There are a lot of construction sites in Tahoe’s neighborhood, so we had an impromptu field trip one afternoon (after I got my Starbuck’s iced coffee.) Tahoe enjoyed visiting a construction site as they closed down in the late afternoon. This building looked very similar to one of the illustrations in the books we read during the week. I discussed with him the different types of materials that were being used in the construction. Reading outside- I read a lot to the grands, but not all reading has to take place inside.There is something wonderful about reading books outside, under a tree. These are great ideas – pinning! So glad you liked the ideas. My grandsons had so much fun with the activities. What a great unit study! My kids are all the same age as your grandsons 7, almost 5 and 3 and I know they will enjoy trying it out. I especially liked your toilet paper rolls + books experiment. What a great way to introduce many complex and important architecture concepts! I will be sharing and pinning. Thanks for linking up @LearningKidLinkup. I’m glad you found some useful activities for your children in my post. The toilet paper roll experiment is an activity that has lots of variables; my grandsons loved it. I’ll be doing this experiment with them again. Thanks for linking with Collage Friday — you are so creative! what a great post! Love the pictures and all the awesome ideas! Keep em coming! I love your theme studies, so creative! Pinning to the practical mondays board.